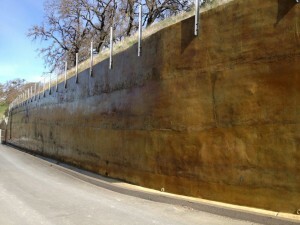 The New Irvington Tunnel project in Alameda County, California is part of the $4.6 billion Water System Improvement Program (WSIP) launched in 2002 to repair, replace, and seismically upgrade the aging San Francisco Regional Water System, often referred to as the Hetch Hetchy system. Owned and operated by the San Francisco Public Utilities Commission (SFPUC), the system delivers drinking water to 2.5 million people in the five counties of San Francisco, San Mateo, Santa Clara, Contra Costa, and Alameda. Built between 1928 and 1930, the existing Irvington Tunnel is an important part of that water delivery system because it connects the water supplies from the Sierra Nevada Mountains and the Alameda Watershed to Bay Area water distribution systems serving SFPUC customers. Expected to be completed by early 2014, the new 3.5-mile tunnel will lie parallel to the existing tunnel between the Sunol Valley south of Highway I-680 in unincorporated Alameda County and the Mission San Jose district in Fremont. 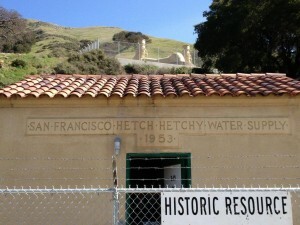 The Town of Sunol receives the majority of its water from the SFPUC and the City of Fremont receives approximately 30 percent of its drinking water from the system. Constructing a tunnel parallel to the existing Irvington Tunnel, in Alameda County, Calif., allows the San Francisco Public Utilities Commission to decommission the Irvington Tunnel for inspection and rehabilitation to improve the water delivery reliability. The total construction cost for the project is estimated at $154 million. The exterior walls leading to the location were stained and required to have superior anti-graffiti protection to help prevent, deter and protect the structure from the elements, paint, labels, markers, other graffiti and various chemicals. The SEI Chemicals Graffiti Proofer was tested and selected for this project. The wall featured in the above picture is approximately 9,000 sq ft and is coated with SEI’s GPA-300 Graffiti Proofer non-sacrificial anti-graffiti coating. 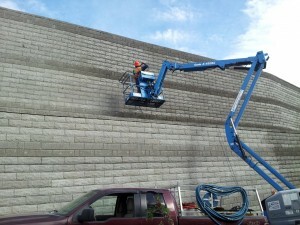 Graffiti removal can be performed without using any chemicals. 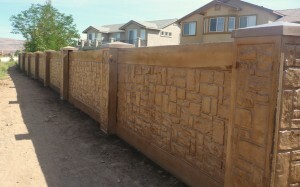 The approximate size of this retaining wall project is 31,389 square feet. The cement block wall was erected to be utilized as an embankment. Behind the wall are hundreds of thousands of cubic meters of organic fill to house a brand new Canadian Tire Superstore. The builder/owner felt that the sheer height and size of the wall would be a prime target for graffiti. The SEI Industrial Chemical Graffiti Proofer was chosen amongst those considered due to its superior protective qualities of allowing graffiti to be removed without the use of chemicals. The normal 10 foot cut off line for graffiti protection has become an increased concern as taggers are using Super Soakers and other apparatus to apply graffiti at elevated heights. 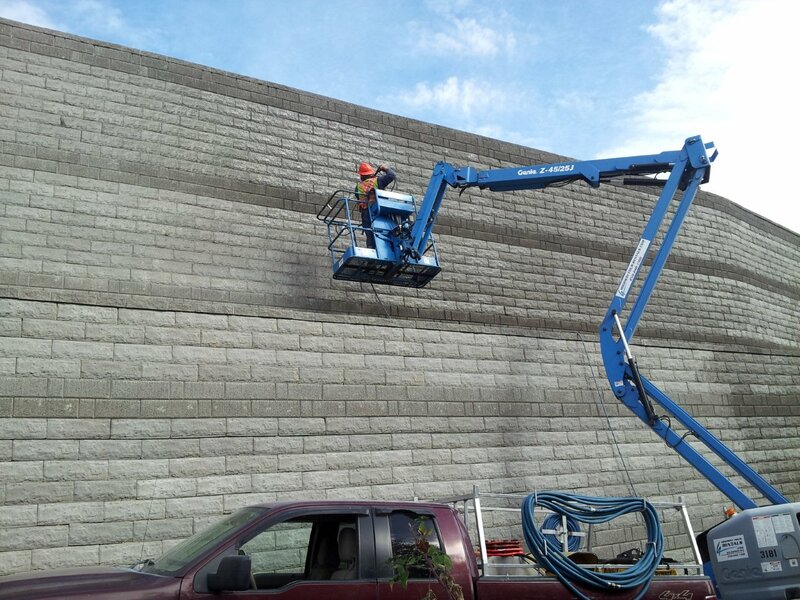 By protecting the entire retaining wall with the GPA-300 Graffiti Proofer, the owner and surrounding residents will be able to enjoy a protected surface for years to come instead of a large permanent canvas for unauthorized graffiti spray paint, stickers and markers. The City of Sparks, a neighboring city to Reno, NV, utilized SEI Chemical’s anti-graffiti coating technology to protect 24,450FT2 of precast concrete sound walls in September, 2012. The project consisted of (4) individual walls, which would all receive an oxidizing stain treatment before being protected with (1) coat of SEI Sealer Prime followed by (1) coat of GPA-300 Graffiti Proofer®. All alternate product submissions ultimately fell short of the requirements and were not approved. The application of the Graffiti Proofer to the Vista sound walls provides the City of Sparks with the largest surface area, in Nevada, which allows graffiti to be removed without using chemicals. 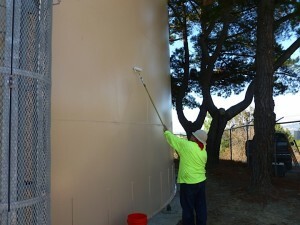 Water tanks are one of the premier targets for graffiti “tagging” with spray paint, stickers and markers. Due to their vast size and the remote location that most water tanks are located, it is a tempting spot for taggers to hang out and perform their “art without permission”. SEI Industrial Chemicals Graffiti Proofer coating is a clear-coat that is applied to the surface and will last for years and many removals… making it the best choice for long term protection. When the substrate does get “tagged” with graffiti, no chemicals are needed to remove most spray paints, stickers and markers. Simply use water and a rag or a low pressure wash with water only. 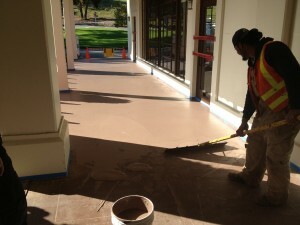 Concrete Anti-Slip Coating TRUST THE COATING USED IN THEME PARKS NATIONWIDE! The BSM-1600 Synthetic Membrane is unique in many ways, but to name a few, it is a single component (no mixing required), does not need a primer, low VOC (<50 g/L), water based, comes in 5 standard colors (plus custom color matches available) and can withstand vehicular traffic. This SEI Industrial coating bonds to asphalt, concrete, raw wood and other porous substrates and is highly resistant to abrasion, impact, moisture, chemicals and atmospheric salts. The anti-slip membrane has tremendous elongation and tensile strength and can be applied in only 1 coat. If it ever damaged simply recoat as the coating adheres to itself. There are many anti-graffiti coatings available in the marketplace, but once you weed out the sacrificial coatings (lasting only one or a couple of removals) and those that can only adhere to metal or painted substrates, then the field gets less crowded. If you were to continue with your “wish list” for long-term graffiti protection by adding that the product needs to be low VOC, clear in color, only one component so you do have to mix chemicals together and versatile enough to adhere to many surface types… you’d be gravitating toward SEI Industrial Chemicals Graffiti Proofer. Just for fun, you should add that the product have excellent non-stick characteristics so those pesky graffiti stickers (a.k.a. “slap tags”) don’t adhere to your surface. While you are at it, why not add to the list that the product should allow you to remove graffiti spray paint, graffiti permanent maker, bubble gum, lipstick and many other types of graffiti by simply wiping it off with a damp towel or using a low pressure wash with no chemicals. No, this is not fiction! SEI Industrial Chemicals has provided the Graffiti Proofer to many municipalities, property owners/managers, contractors and professionals for years to cover valuable assets like- split face block and cement block sound walls, stucco buildings, brick walls, metal signs and bridges, vinyl wrapped utility boxes, metal painted doors, wood fences, water tanks, fountains, rocks, plastic fire alarm pull covers, newsstands, murals and many more surfaces. 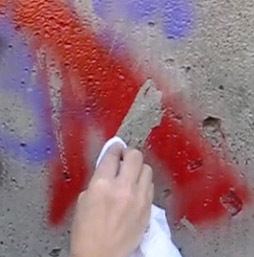 Take a look at the Graffiti Proofer in action. Many metal painted surfaces are “powder coated” which is typically used to create a hard finish that is tougher than conventional paint. Metal park benches, newspaper stands and painted metal gates are just a few examples. The disappointing thing about a powder coated surface is that it is usually subjected to spray paint graffiti, permanent markers and graffiti stickers (a.k.a. “Slap Tags”) and other forms of graffiti. Once “tagged”, minimal to moderate success at removing graffiti is achieved. 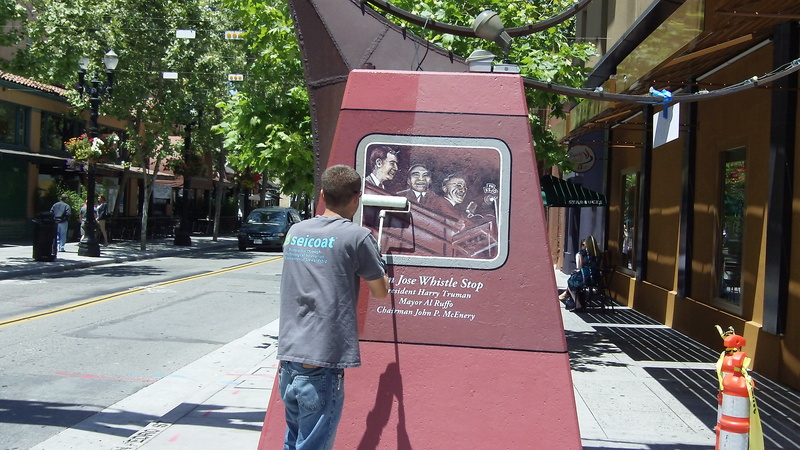 Even more frustrating is that, by the nature of design, powder coatings can be very difficult to apply a “top coat” anti-graffiti product over. The SEI Graffiti Proofer single component non-sacrificial graffiti resistant coating has experienced much success over a myriad of powder coated surfaces like the attached ornamental gates. This video illustrates graffiti removals of graffiti spray paint and graffiti stickers from a powder coated newsstand and window that has been protected with the Graffiti Proofer by SEI Industrial Chemicals applicators. What happens when you accidentally paint over SEI Industrial Chem.- Graffiti Proofer? This structure was subjected to constant graffiti tags and was painted over every few days. It has been cleaned and coated with SEI Industrial Chemicals Graffiti Proofer. It can be confusing trying to decipher how to be an environmentally conscious company and a good corporate citizen when addressing graffiti problems that surround your environment. 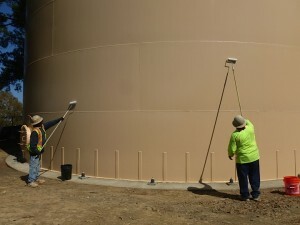 There are a myriad of anti-graffiti coatings that range from only lasting for one graffiti removal (sacrificial coating) to surviving several graffiti removals (semi-sacrificial) to protecting a surface for many graffiti abatements (non-sacrificial). When evaluating anti-graffiti coatings consider this, SEI Industrial Chemicals Graffiti Proofer is made in Southern California under the strict rules of the SCAQMD which are arguably the toughest standards in the nation. But when you really drill down to the entire lifecycle of graffiti and how it is dealt with, the Graffiti Proofer GPA-300 environmental footprint is stellar. Sure you may locate a zero VOC product, but if it is a 2 component product, then you expose your personnel to mixing chemicals and many use caustic chemicals as the catalyst. Environmentally friendly, sustainability, LEED points, VOC’s, Green Seal, Green . . . Welcome to the SEI Industrial Chemicals Blog!